What are the alternatives to ‘boring’ Bishopsgate Goodsyard scheme? 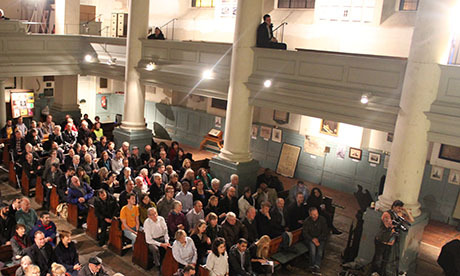 Over 200 residents packed out Shoreditch Church to voice concerns contentious proposals to develop the disused Bishopsgate Goodsyard site. 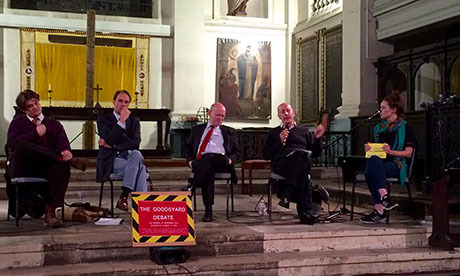 After a lively debate on Monday evening (16 November), both audience and panel members put forward alternative plans for the Shoreditch site. Speaking to the Hackney Citizen, Mayor Jules Pipe highlighted three “crucial” changes he thought must be made to the current plans. “Those two tower blocks are going to be full of luxury housing,” he continued, commenting on the lack of affordable housing in the scheme. The Mayor also criticised the lack of workspace available for Tech City expansion. “We pushed them hard on that and their response was to just add an extra block. “But it’s probably never going to be built because it is the last thing they plan to build in the scheme. Moshfiqur Noor, a Tower Hamlets resident, thinks large expensive developments will dilute the borough’s diversity. The 30 year-old said: “I’m worried we’re going to see an ethnic cleansing of the East End. It has always been rich in colour but I’m not convinced local people will be able to afford these flats. Mr Noor, who lives in Wapping, said residents must stand up for themselves. “We’ve had huge developments happen here and the community has got nothing. We must fight back and not just accept what they give us. Rupert Munday, 30, an architect who lives in Tower Hamlets, said the developers had failed to bring something innovative to the area. “The Goodsyard is a great opportunity to have an exciting scheme that offers affordable housing and something different to other developments. “But this proposal would actually detract from the area. It’s just boring and dull,” he said. “What’s happening to local residents is very sad. They are being forced out of London more and more. I was born in Whitechapel and I grew up here, and it is such a struggle to stay where you grew up,” she said.